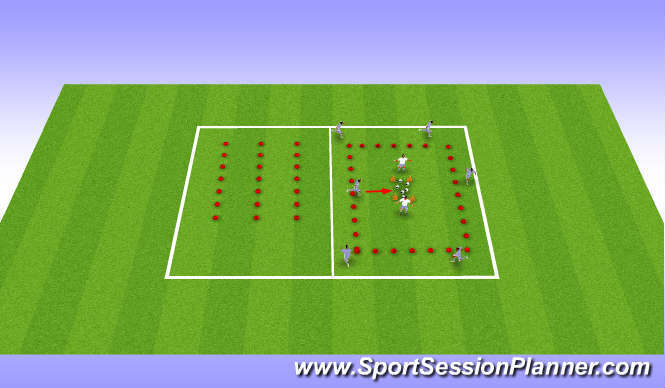 Rob the nest - 2 players are allocated role of defending 5 footballs in centre of 20x20. Remained players are moving outside of grid and must try and steal a ball without being touched by defenders. Player roles are rotated when all balls have been lost. Emphasis on quick movements, team work, agility and tactics. 1. 6 poles - players run from either end weaving in and out of poles until they meet at middle cone. They stop into athletic stance, and wait for command before running to blue (left) or red (right) cone. 3 sets of running into centre and to cone, 3 sets waiting for command. 2. Palmer Drill - players run through ladder (one foot, two foot, toe tap, and jockey backwards), land in athletic stance and on command run to one of 6 cones. 2 sets of each variation. 3. Shadow drill - players pair up and have 20 second rounds of close shadowing before swapping over. x 3 with 30 seconds rest.